Search: eliminate the inconvenient extra step of uncertain searches. Commerce: eliminate the need for a separate journey to another place to figure out the best product and buy it, which is a time-consuming interruption. Dominance: reduce Google’s surveillance and personal targeting of everyone, reduce Amazon’s capture of customer relationships from leading companies. More important, this new technology tangibly changes the way we think about human potential. This new technology—named active knowledge, active resources, and active commerce—delivers success everywhere to everyone who wants it, during the moment they needed. It responds to gaps by offering successful steps, tools, and commercial choices. What happens when everyone can switch from not knowing the answers to a lifetime of growth through personal successes as the normal way to live? Without classrooms or degrees, a digital economy will raise every person to the top. Billions of people will become as good as humanity’s combined abilities. Active knowledge: how can everyone be the best in the world? Starting from what we do on devices all day long, active knowledge connects that to the best knowledge on how to succeed. How does this help people and please customers? For every product and service, only the top quarter are in the top 25% of performance. 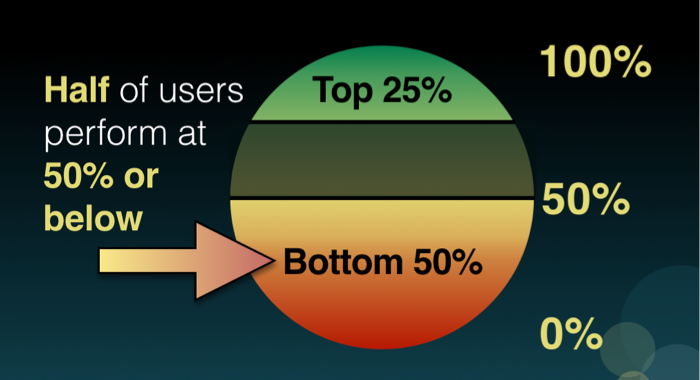 Half the users perform at the 50% level or below. Now add active knowledge. On the left of this fictional illustration, this woman is at the 42% level. Active knowledge is optional, so when she chooses to use it, she rises to the 61% level. Active knowledge isn’t critical thinking, it’s actually intelligence amplification (IA). If you’re this user and use your journey’s active knowledge, it can direct you to the 61% level of performance. But active knowledge does much more. It adds an invisible embedded marketing channel. It tells its user: if you switch to the best performing product or service, you can be at the 85% or 90% level of performance. Do you know who would do that for millions of people? Stop thinking about AI and how artificial intelligence is going to take away jobs. Start thinking about intelligence amplification and how it will make everyone the best at what’s important to each person. As the world speeds up, new technology will be everywhere. Tech will be how the world lives, works, learns, and gets entertained every day. That makes this decade a unique and historic transformation. Exponential growth will transform many industries and social institutions at the same time. That causes minute-by-minute problems everywhere. What is missing? There is no universal platform that turns these waves into saves. Active knowledge is triggered by these gaps. It changes problems into rapid progress for everyone. At the very moment when the world’s population risks producing overwhelming failures, active knowledge adds a system that turns gaps into rapid successes. For exponential growth publishing, its active knowledge services can scale to many industries. Here are three of these business opportunities. 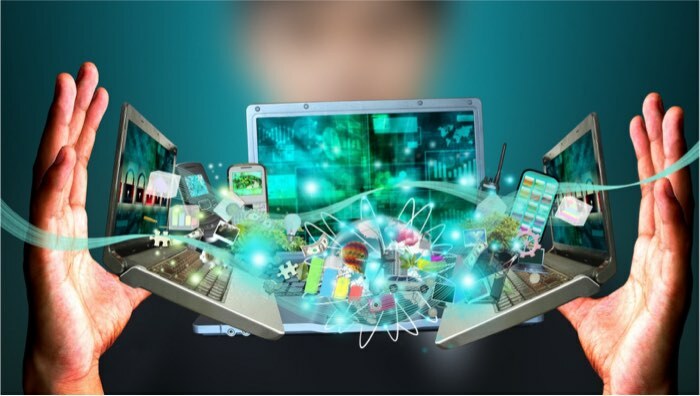 Accelerate the success of new technologies: artificial intelligence (AI), augmented reality (AR), voice interfaces and other new technologies all send waves of advances into the lives of users who don’t know what to do with them or how to benefit from them. Accelerate the success of the internet of things and the industrial internet: these add billions of sensors that will reach alert levels and send notifications. People will receive these notifications as interruptions. Accelerate the success of work, business, and the supply chain: new tools, communication, and processes will repeatedly transform how a digital economy works. These are some areas where active knowledge adds value. Billions of users are about to face gaps and problems during use. When active knowledge finds and fixes gaps during use, each person can rise toward becoming the best. 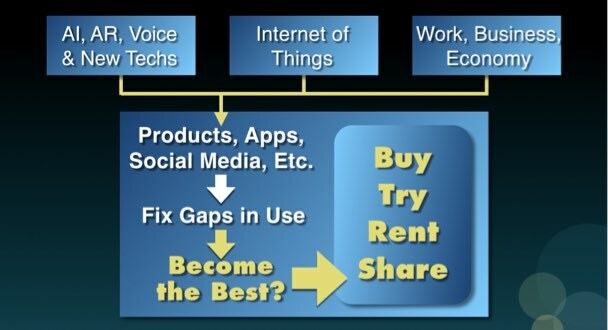 If they switch to a new tool or product, active commerce can let them buy, try, rent, or share. These will be some of the transactions where exponential growth publishers can earn a percentage of the revenues. This opens the door to a new kind of leadership. This is the first platform where making everyone the best is continuous, visible, and profitable. Active knowledge “sees” what the world is trying to do, where it fails, and what the problems are. It uses self-optimization to identify the best answers and deliver them until they are improved upon. It continuously improves itself. It delivers the humanity’s combined latest and best solutions directly to each person when they need them, through an invisible embedded channel that includes knowledge, tools, resources, and commerce. When people choose the best, they receive an immediate bridge from today into the best world in which they can live. Companies will want all their employees to be the best they can be. Countless people will want to be as good as the best in the world to live a better life today. Publishers and media companies, with exponential growth publishing, can lead this new economic and human progress. A digital economy will make everyone the best by making it normal for everyone to live at the top every minute of every day.